Racing has won the Primera División 18 times (with a record of seven consecutive championships between 1913 and 1919), apart from winning 12 National cups such as five Copa Ibarguren, four Copa de Honor Municipalidad de Buenos Aires and one Copa Beccar Varela. Due to those achievements the team was nicknamed "La Academia" ("The Academy of Football") which still identifies the club and its supporters. On international stage, the club has won 6 titles, 3 of them organised by CONMEBOL and other international bodies. Those achievements include one Copa Libertadores, one Intercontinental Cup and the first edition of the Supercopa Sudamericana. In addition, Racing won Rioplatense competitions Copa Aldao twice and Copa de Honor Cousenier once. The first team plays its home games in the Estadio Presidente Juan Domingo Perón, nicknamed El Cilindro de Avellaneda (in English: "The Cylinder of Avellaneda"). Apart from football, other sports practised at Racing are artistic gymnastics, basketball, boxing, field hockey, handball, martial arts, roller skating, tennis and volleyball. The history of the club can be traced in 1898, when a group of young football players decided to create a team named "Excelsior Club". It lasted three years until in 1901 it divided into three clubs, Sud América F.C. de Barracas al Sud, American Club and Argentinos Unidos. Barracas al Sud officialised its establishment on 12 May 1901, with Pedro Werner becoming its first president. Less than one year after the establishment, an internal conflict about what color of jersey should be adopted caused a group of members to found Colorados Unidos, which adopted red as color. This division did not last too long, and in March 1903, both clubs agreed to merge into a new club under the same name. The club took its name from a French auto racing magazine owned by Germán Vidaillac (a founding partner of French ancestry). The suggestion was well received and the name "Racing Club" was immediately approved. Racing was the first football team integrally formed by criollos. The first jersey worn by the emerging club was white, until 25 July 1904, when it was decided a yellow and black vertical striped jersey would be used. Nevertheless, the recently adopted uniform only lasted a week due to its similarity to Uruguayan club CURCC, being replaced by a design proposed by president Luis Carbone. The jersey had four squares, two light blue and two pink. This light blue and pink design would be worn until 1908, once again replaced by a design with three horizontal bars (two blue and one white). Finally, Racing adopted the light blue and white colors in 1910, in commemoration of the May Revolution's 100th anniversary that same year. Racing affiliated to the Argentine Football Association in 1905, and began playing in the lower divisions of Argentine football league system. In 1906 the club registered to play in Segunda División. In 1909 Racing competed in a playoff to promote to Primera División, but lost to Gimnasia y Esgrima de Buenos Aires. Racing finally promoted to the first division in 1910, winning the playoff final against Boca Juniors with an attendance of 4,000. The line-up that won the promotion was: Fernández; Seminario, Allan; Winne, Juan Ohaco, Angel Betular; Oyarzábal, A. Ohaco, Firpo, Frers and Juan Perinetti. Frers and Ohaco were the scorers for Racing. In 1911 Racing debuted in Primera División, finishing in fourth place. One year later, Racing won its first domestic cup, the Copa de Honor Municipalidad de Buenos Aires after beating Newell's Old Boys 3–0. The first league title came in 1913 when Racing defeated San Isidro at the final in a playoff series after both teams (along with River Plate) finished first. To crown a champion, the association decided a play off series. Racing first eliminated River Plate (3–0), and then played the final against San Isidro, which it defeated 2 to 0 (two goals by Ohaco). 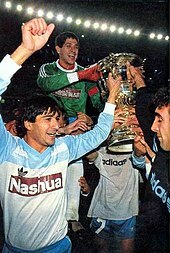 That same year Racing won another domestic cup, the Copa Ibarguren after beating Newell's Old Boys 3–1 in Avellaneda. The line-up was: Muttoni; Reyes, S. Ochoa; Pepe, Betular, Olazar; J. Viazzi, Ohaco, Marcovecchio, Juan Hospital, Juan Perinetti. In 1914 Racing won its second league title, having scored 42 goals and only 7 received in 12 games. The runner-up was Estudiantes (BA). That same year Racing won its second consecutive Copa Ibarguren, defeating another Rosarino team, Rosario Central, by 1–0 in Buenos Aires. The line-up for the match: Arduino; Reyes, S. Ochoa; Pepe, Olazar, Betular; Canavery, Ohaco, Marcovecchio, Juan Hospital, Juan Perinetti. The 1915 team achieved an outstanding mark of 95 goals in 24 matches. Racing became Primera División tri-champion in 1915 when the squad defeated San Isidro 1–0 at a playoff at arch-rival Independiente stadium. Racing line-up was: Arduino; Presta, Reyes; Betular, Olazar, Pepe; Canavery, Ohaco, Marcovecchio (who scored the only goal), Juan Hospital, Juan Perinetti. Racing finished unbeaten, with 22 games won and 2 drew over 24, with an outstanding record of 95 goals scored with only 5 conceded. The line-up vs. San Isidro was: Arduino; Presta, Reyes; Betular, Olazar, Pepe; Canavery, Ohaco, Marcovecchio, J. Hospital, J. Perinetti. In 1917 Racing won four titles in the year. 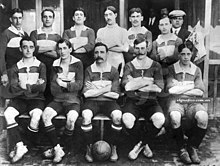 Racing won the following title, the 1916 championship, totalizing 34 points in 21 games with 39 goals converted and 10 received at the end of the tournament. Platense was the runner-up with 30 points. The 5th consecutive title was in 1917 after totalizing 35 points, being River Plate the runner-up with 30 points. The team also scored the mark of 58 goals with only 4 received in 20 fixtures. In addition, the squad achieved its third Copa Ibarguren with a smashing victory over Rosario Central by 6–0 in Avellaneda. The line-up was: Arduino; Ohaco, Reyes, Viazzi Olazar, Ricardo Pepe; Canavery, Vivaldi, Marcovecchio, Juan Hospital, Juan Perinetti. That same year Racing won another edition of Copa Ibarguren, defeating by 2nd. consecutive time Rosario Central by 3–2 at GEBA stadium. The line-up was: Crocce; Castagnola, Reyes; Vivaldi, Olazar, Pepe; Natalio Perinetti, Ohaco, Marcovecchio, Minondo, Juan Perinetti. Racing won its 8th title in 1921 playing in the dissident "Asociación Amateurs"
One year later, Racing won its 6th. league title, remaining unbeaten after 19 games played, with 49 goals scored and 9 received. Racing also won another edition of Copa Ibarguren (5 in total) with a large victory over Newell's Old Boys by 4–0 at GEBA. The line-up: Crocce; Castagnola, Reyes; Ohaco, Marcovecchio, Macchiavello; Natalio Perinetti, Zabaleta, Vivaldo, Juan Hospital, Juan Perinetti. In 1919 Racing moved to the dissident league "Asociación Amateurs de Football", winning the tournament whilst remaining unbeaten again. Racing played 23 fixtures, winning its 7th. consecutive title with 26 points and 43 goals scored. River Plate finished the extraordinary sequence of Racing's 7 titles, when winning the 1920 championship. Racing was the runner-up only 2 points to River. Racing remained in the Asociación Amateurs league, where the team won the 1921 title after playing 38 matches and totalizing 66 points. Racing also scored 73 goals receiving 16. Racing would crown champion again in 1925, totalizing 39 points in 24 matches played, with San Lorenzo being runner-up. During its first 22 years of existence, Racing won 9 Primera División championships (seven of them consecutively, which is still a record in Argentine football). Due to those extraordinary campaigns and its style of playing, the squad was nicknamed "The Academy of Argentine football", which has been adopted by its supporters as a mark of identity, still used nowadays. To sum-up, Racing achieved a large number of titles during the 1910s and 1920, including 7 Primera División championships, 9 national cups and 2 international titles. Some of the most notable players of those years were Alberto Ohaco, Alberto Marcovecchio, Pedro Ochoa (known as "The King of dribbling" – "El Rey de la gambeta" in Spanish, also a close friend to Carlos Gardel, who wrote the tango "Patadura" in his honour) and Natalio Perinetti. The 1932 team that won the Copa Beccar Varela. During those years Racing won the Copa Beccar Varela in 1932 (defeating Boca Juniors in the final) and the Copa de Competencia (LAF) one year later, thrashing San Lorenzo de Almagro by 4–0 in the final match. Despite the national cups won, Racing could not win any domestic championship during that period; its best performances were third places in 1932, 1933 and 1936. Evaristo Barrera was the top scorer with 34 goals in 1934 and 32 in 1936. Racing didn't any domestic title during the 1940s, their best finish was 4th place in 1946 and 1948. During the 1948 tournament Racing was leading followed by Independiente and River Plate until a strike took place. Most of the dissident players went to play outside Argentina and they had to be replaced by players from the youth divisions. Moreover, points awarded to Racing were deducted from the matches against Banfield and San Lorenzo; as a result, Racing lost the chance to be champion and arch-rival Independiente finally won the title. In 1945 Racing won the Copa de Competencia Británica defeating Boca Juniors by 4–1 in the final. The 1949 Racing team won the first of three consecutive Primera División titles. In 1949, Racing won 8th league title (the first in professional era), with Llamil Simes as the top scorer of the tournament. Racing also won the 1950 title with Simes as scorer again with 20 goals. That same year Racing inaugurated its stadium, named "Presidente Perón", defeating Vélez Sarsfield 1–0. In 1951 Racing won its third consecutive title since 1919, playing two playoff matches against Banfield, which ended 0–0 and 1–0 (goal by Mario Boyé). Guillermo Stábile was the coach of the team. In 1952 Racing finished second after River Plate. The team was not able to win the title despite having the fewest goals scored against it during the championship. After another good performance in 1953 when the team finished third, Racing placed tenth in 1954, far from champion Boca Juniors. In 1958 Racing won their 13th. league title, and they were runners-up to San Lorenzo de Almagro the following year. During those years Racing Club had many notable players that made their contribution to the successful campaigns. Some of them were Norberto Mendez, Rubén Bravo, Llamil Simes, Mario Boyé, Alberto Rastelli, Pedro Dellacha, Ezra Sued, Manuel Blanco, Ernesto Gutiérrez, Pedro Manfredini, Arnaldo Balay, Juan José Pizzuti, Rubén Héctor Sosa and Omar Oreste Corbatta. In 1967 Racing achieved international success, winning the Libertadores and Intercontinental Cups. Racing finished 4th in 1960 with a top scoring 72 goals. During this tournament Racing also achieved its largest victory in Primera División, an 11–3 against Rosario Central. In 1961 Racing won another championship totalizing 47 points when coached by Saúl Ongaro. The team was also the highest scoring team with 68 goals. The next year, Racing finished 9th and was also eliminated from the Copa Libertadores de América in the first stage. Racing won their 15th. title in 1966, scoring 70 goals. In the 1967 Torneo Metropolitano Racing reached the final where the squad lost to Estudiantes de La Plata by 3–0. That same year Racing won the 1967 Copa Libertadores after beating Uruguayan team Nacional 2–1 in the final. Norberto Raffo was the top scorer with 13 goals. At the end of the year Racing won the Intercontinental Cup defeating Celtic in a playoff game. The first match had been played at Glasgow where Racing was beaten 1–0 while La Academia won by 2–1 the second game in Buenos Aires. The playoff was played in Montevideo where Racing achieved its second continental championship winning 1–0 with a goal scored by Juan Carlos Cárdenas. During the 1970s Racing did not win any title, although the team finished 2nd to San Lorenzo in the 1972 Metropolitano, with 43 points in 34 matches. That year was the debut of Ubaldo Fillol, who some regard as the best Argentine goalkeeper ever. Fillol set a record of 6 penalty shots stopped in the same season. From 1974 and 1978 Racing made poor campaigns and was near relegation in 1976 when the team finished next to last (San Telmo was finally relegated). One year later, after two seasons in the second division, Racing returned to the top division in 1985 after winning a playoff for the second promotion place against Atlanta; Racing won 4–0 the first game and the second match finished 1–1. Racing won its third international competition in 1988, when the team won the first edition of the 1988 Supercopa Sudamericana, defeating Brazilian team Cruzeiro in the finals, with Alfio Basile still as coach. That same year Racing won the Supercopa Interamericana beating Sportivo Herediano from Costa Rica 3–0. Racing also played another Supercopa final and was defeated by Cruzeiro 4–0 in Belo Horizonte. Racing won the 2nd match 1–0 but the cup was awarded to the Brazilian team by goal difference. Racing faced financial problems that erupted in 1998, when the club declared bankruptcy pursuant to the request of president Daniel Lalín. In 2000, Racing switched management to the Blanquiceleste S.A corporation. Despite the financial crisis that ruined the club, Racing won the 2001 Apertura title, 35 years after its last local championship in 1966. The team was coached by Reinaldo Merlo who became an idol due to this achievement. Maximiliano Estévez, Gabriel Loeschbor, Claudio Ubeda, Adrián Bastía, Francisco Maciel and Diego Milito were part of that team. In 2012, Racing reached the final of the 2012 Copa Argentina Final although the squad lost to Boca Juniors by 2–1. In June 2014, Diego Cocca was hired as head coach. Few days after Cocca signed his contract, former player and fans favorite Diego Milito left Inter Milan and returned to the club to play the 2014 Torneo de Transición. In December 2014, Racing won its Primera División 17th. title in the last fixture of the tournament. The team defeated Godoy Cruz by 1–0 to secure the 1st place and crowned champion. Racing totalized 41 points over 19 games played, with 13 won, 3 drew and 4 lost. Racing scored 30 goals and conceded 16. Forward Gustavo Bou was also the team's topscorer with 10 goals. The line-up for that match was: Saja; Pillud, Lollo, Cabral, Grimi; G. Díaz, Videla, Aued, Centurión; Diego Milito, Bou. ^ This model was worn again in 1973, although just for one match. Racing Club plays its home games at "Estadio Presidente Perón" (named in honor of former President of Argentina Juan Domingo Perón), popularly known as "El Cilindro de Avellaneda" (due to its cylindrical shape) and "the Coliseum". It was opened in 1950 and restructured in 1997. The field measures 105 x 70 m. The Racing stadium is the second largest in Argentina after the River Plate stadium. At first the venue could host a capacity of 120,000 but subsequent restructurings reduced its capacity to 64,161. 1 This rank only consists of records from 1931 to date. ^ a b c d e f g h i j k l "Palmares" (in Spanish). Racing Club. Retrieved 14 November 2017. ^ "Polideportivo J. Camba – Racing Club – Sitio Oficial". ^ "Argentina 1911". RSSSF. La Nación and La Prensa (Buenos Aires). Retrieved 21 December 2016. ^ Osvaldo Gorgazzi and Hector Martinez (8 December 2016). "Argentina - List of Champions and Runners-up". RSSSF. Retrieved 2 March 2017. ^ "Futbol - Universofutbol.com - Futbol argentino e internacional – La Página de estadística y futbol". ^ "Argentina Second Level 1985". ^ "Estadio Presidente Perón". Soccerway. Global Sports Media. Retrieved 18 June 2012. ^ Características del estadio at Club's official website[permanent dead link]. ^ "Racing Club squad". Soccerway. Retrieved 8 October 2018. ^ "CIHF: Historia - Campeones del Fútbol Argentino". ^ a b c d e "Argentina - Domestic Cup History". RSSSF. 14 November 2017. Retrieved 14 November 2017. Wikimedia Commons has media related to Racing Club de Avellaneda.